Douglas Campbell is Professor Emeritus at Michigan State University, where he was Professor of Horn for 45 years. He is a highly regarded horn teacher, fondly remembered by his students for his gentle, student-centered personality that expected nothing but the best work from his students. He also started the first regular regional horn workshops and hosted an IHS International Workshop. Doug was born in Wichita Falls, Texas in 1924. He started playing trumpet at age nine and switched to horn four years later. As a self-taught hornist, he played in his school band and orchestra and in the Wichita Falls Symphony. At age 16, he enrolled at North Texas State University. While a student there, he performed with the Oklahoma City, San Antonio, and Waco Symphonies, as well as Dallas's Starlight Opera. He earned a bachelor's degree from North Texas in 1944, then went to Eastman School of Music, where he studied with Arkady Yegudkin and Morris Secon and earned an MM in 1946 and a PhD in Music Theory in 1957. Doug has played with the National, Houston, Grand Rapids, Santa Fe, and Lansing Symphony Orchestras. He was hornist with the Richards Quintet, ensemble-in-residence at Michigan State University, which toured the US, Canada, and China; played for a State Dinner at the White House during the Carter administration; and has issued two recordings, with Crystal Records and Musical Heritage Society. In addition to his position at Michigan State University, Doug has been visiting professor at the University of Oregon, adjunct faculty at the University of Missouri - Kansas City, and taught for 10 summer seasons at New England Music Camp and 25 summer seasons at the Interlochen Center for the Arts. 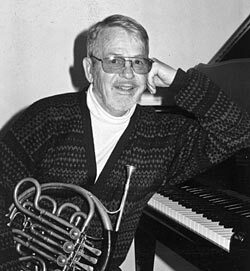 Randall Faust composed Harmonielehre for Solo Horn in 1996 in his honor. Doug, with Neill Sanders, hosted an event in 1970 known as "The Horn Fandango," which set the stage for the development of regional horn workshops. Doug's Horn Fandango became an annual event, involving students from many Michigan music schools, with hosting duties rotating between the horn studios of Michigan University, the University of Michigan, and Western Michigan University. Featured artist alumni included Ifor James, A. David Krehbiel, and Barry Tuckwell. The final Horn Fandango was held in 1983. Doug hosted the IHS International Workshop at Michigan State University in 1978 and the Great Lakes Regional Workshop in 1988. Though no longer an active teacher or performer, Doug attends as many concerts as possible on the nearby Michigan State University campus. In his retirement, he enjoys grilling and gardening, and looks forward to cataloging his large collection of printed and recorded music. Doug received the Punto Award at the IHS Workshop in Eugene OR in 1996. He received the IHS Service Medal of Honor at the 2014 IHS Symposium in London. A profile appears in the November 1996 issue of The Horn Call.